Singapore travel guide will help curious travelers explore this fascinating island, city, and nation. The multi-ethnic culture, thanks to expats from various countries have all contributed to the cultural diversity of this country. Because Singapore hosts people from so many ethnicities, there are festivals celebrated all through the year. Singapore has something to offer to every kind of traveler. One can see modernist architecture, sandy beaches, gardens, safari trails, museums, malls, Hindu, Buddhist, and Chinese temples, mosques, cathedrals, a giant theme park – the list is endless! You will need a minimum of one week to cover most of the tourist attractions in Singapore. Singapore lies close to the Equator and hence it is hot and wet throughout the year and there is rainfall once every two days throughout the year. 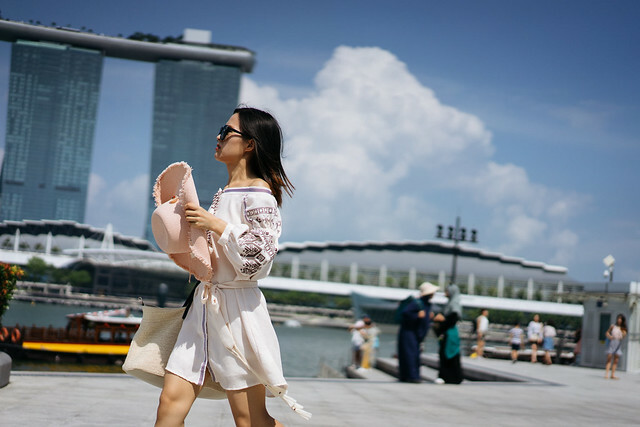 Since Singapore is a prime holiday destination, it is best to visit when the schools are functioning to avoid locals holidaying at the same time. It is a year-round destination and it is evident as tourists pour into this island nation all through the year. So, the best time to visit Singapore is from June to August. It is going to be hot and especially humid all the time. So wear light cotton clothes. Always carry an umbrella as it rains often. It rains for a brief 30 – 60 minutes and you can continue exploring the outdoors. These brief showers are usually quite refreshing, as they provide respite from the sun. Carry sunscreen, a foldable umbrella or a raincoat and wear light cotton clothes since it is very humid in Singapore. Singapore travel guide: How to reach Singapore? Singapore is one of the largest transportation hubs in Southeast Asia. 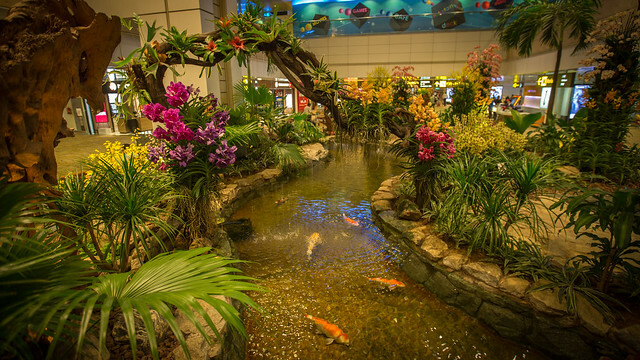 It has the distinction of having the world’s best airport – Changi Airport. The airport is located 20 km northeast from the city center. The airport receives flights from almost every leading airline from around the world. There is a flight landing or departing at Changi Airport almost every 2 minutes! Your holiday in Singapore begins the moment you enter the airport itself! Travelers extoll the grandeur of Changi Airport for the attention to detail in terms of design and the various installations within its premises. Changi Aiport truly sets the tone of what you can expect in this amazing country when you step outside. Terminal 1 has a cactus garden, a rooftop swimming pool, jacuzzi, water lily garden, and the World’s largest kinetic art sculpture. 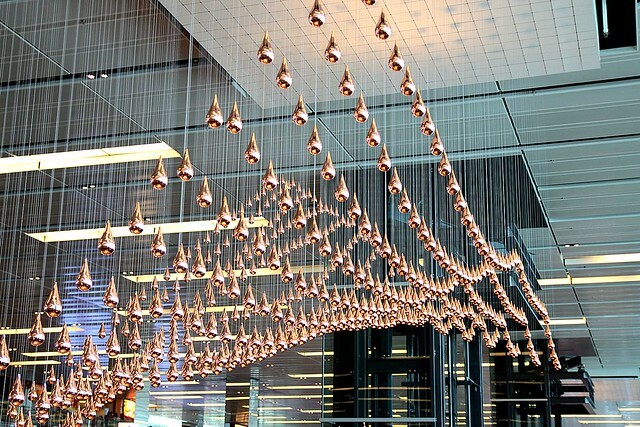 It is an installation of 1,216 polished copper raindrops suspended from the roof and changing patterns in the air! Terminal 2 has an orchid garden, an Entertainment Deck, and a free 24-hour cinema! You can see a butterfly garden having 1000 species and a six-meter waterfall at Terminal 3. The city has an extensive train system and a good public bus network. 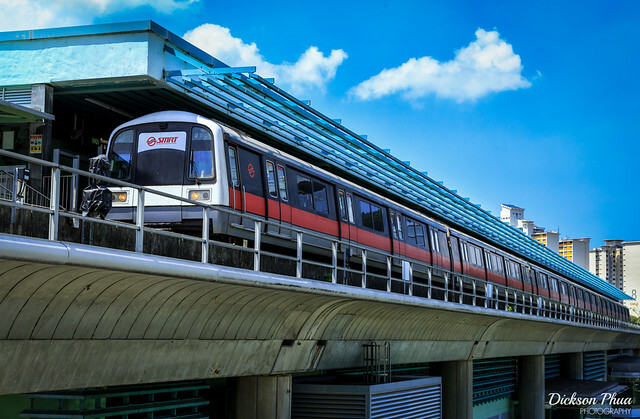 If you are equipped with a Singapore Tourist Pass, then you can seamlessly travel through the length and breadth of the city on public transport. Additional USD 0.22 for every 350m after 1 km There are blue, maroon, red, white and pink colored cabs on the road. You can also use Uber and Grab. Buy the Singapore Tourist Pass and travel unlimited throughout your trip. It costs USD 10 for 1 day, USD 16 for 2 days, and USD 20 for 3 days. These can be bought at MRT stations, selected TransitLink Ticket Office or Automated STP Kiosks. Singapore is notorious for its high hotel prices. Staying at prime locations is expensive. If you have the budget for a 5-star hotel, then Marina Bay Sands it is. For families, beach lovers and others looking for mid-range hotels, then Sentosa Island is a good option. 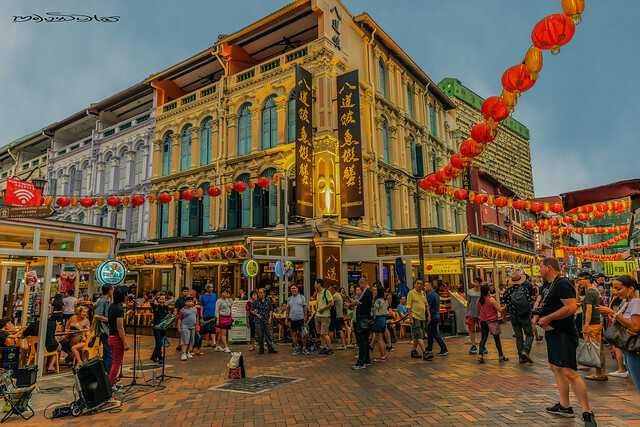 Backpackers on shoestring budget can find accommodations in Clark Quay, Little India, and China town. Orchard Road is for those who want to shop till they drop in Singapore. Located right beside the Marina Reservoir, this sprawling garden combines greenery and modern architecture. The Supertree Grove, Cloud forest, and the Flower Dome, with the Flower Dome being the world’s largest columnless glasshouse. Take the OCBC Skywalk between two Supertrees to enjoy views of the Garden from the top. There are so many plant species from around the world placed in this garden. A combination of an engineering feat, architectural marvel, and bold design fills the Singaporean skyline in front of Marina Bay. This place is boasts of luxury accommodation, upscale shopping, and an infinity pool which gives you the best views of Singapore from an enviable height. This famous promenade is a 3.5 km walkway. There are good seating arrangements to spend a nice evening here with fantastic views of the skyline on the other side. The light and water show called Wonder Full takes place every evening. It is free for everybody and the show has laser light and water projections. This iconic sculpture of half-fish and half-lion spouting water from its mouth was printed on almost every Singapore tourism promotional material. Called the Merlion, it is a mythical creature with a lion’s head and the body of a fish. The Merlion represents the humble beginnings of Singapore as a fishing village. Locally known as Mandai Zoo, this zoo is known to place animals in spacious open enclosures separated from visitors by moats. It is a 26-hectare wildlife park that’s home to more than 2,800 animals. The zoo houses the largest captive colony of orangutans in the world. 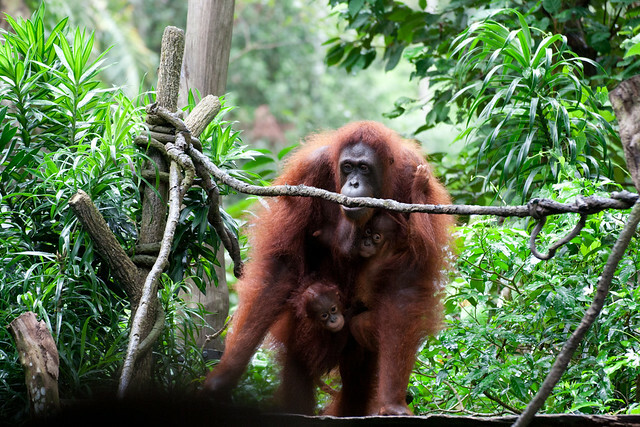 Singapore Zoo has one of the world’s best conservation initiatives and Orangutan breeding programs. The best part about the zoo is that you do not feel like you are in a typical zoo but makes you feel like you are in a rainforest. 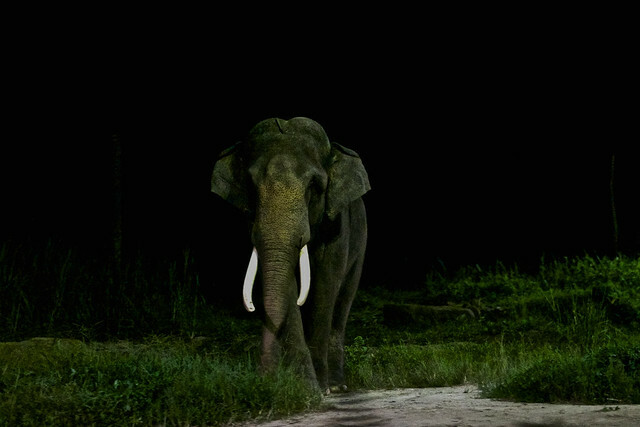 The world’s first nocturnal zoo, the Night Safari is a thrilling experience. You can see flamingo, mountain goats, rhinos, different species of deer, elephants, tigers, lions, hyena, and buffaloes. The setting is very natural to observe wildlife being active in the night. It is divided into seven geographical zones, which can be explored either on foot via four walking trails, or by tram. It is a bird lover’s paradise. 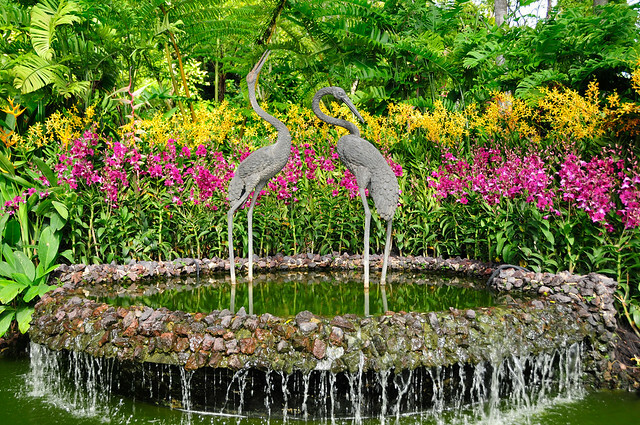 Located on the western slope of Jurong Hill, spread across 20.2 hectares is a sprawling park having a collection of over 5,000 birds from 400 species. Visit the Waterfall Aviary which one of the world’s largest walk-in aviaries, having a 30 m high waterfall and home to more than 600 birds. There are exclusive zones for birds like the Flamingo Lake. You will elegant pink feathered birds strutting in the lake. Also, the Pelican Cove having the many species of pelicans. This 158-year old tropical garden is a UNESCO World Heritage Site. The garden has more than 10,000 species of flora. The main attraction is the National Orchid Garden having a collection of more than 1,000 species and 2,000 hybrids of orchids. You will find otters playing in the water and monitor lizards lying on the ground lazy near the lake. A must-visit in Singapore, this aquarium has 800 species of marine life on display here. The best experience is when you walk through the glass tunnels and giant fishes swimming past you. Experience the feeling of gliding with Sting Rays, Sharks, Octopus, Jellyfish, and more. It is an island on Singapore’s southern coast. The Tiger Sky Tower is 110 m tall and the views from the observation deck are amazing. You can see Singapore city and on a perfect sunny day, you can see as far as Johor Bahru (Malaysia) and Indonesia’s skyline. Visit the Butterfly Park & Insect Kingdom, and also the three beaches on Sentosa called Siloso, Palawan, and Tanjong. These beaches are pristine and perfect for families to hang out. If you are adventure enthusiast, go to iFly Singapore which is the world’s largest wind tunnel for indoor skydiving. The MegaZip in the Mega Adventure Park is Southeast Asia’s steepest zip wire. 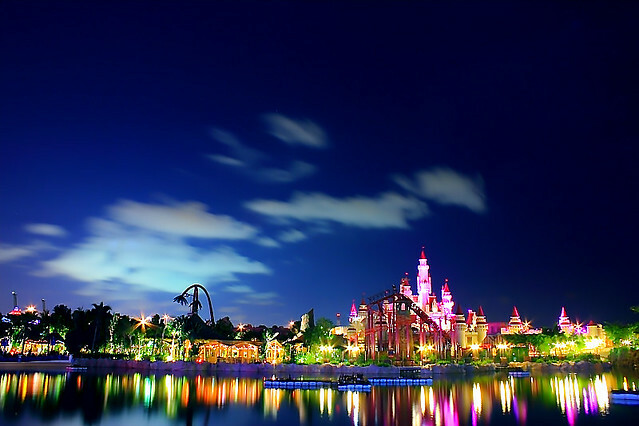 This theme park is located on Sentosa Island. It is a truly high class with amazing rides, shows, food, and entertainment. A trip to Singapore is incomplete without paying a visit to Universal Studios especially if you have kids. Carry extra cash with you as there are so many souvenirs to purchase. 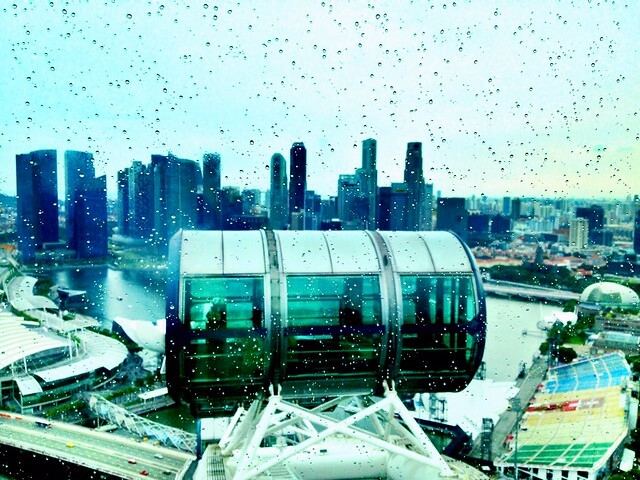 The giant Ferris wheel 165 m tall is the best way to see panoramic views of Singapore. Take the 30-minute ride during the dusk and in the night to see the skyline. Singapore is a shopping destination hosting brands for all pocket sizes. A 2.2 km long stretch, Orchard Road offers plenty of malls with play areas for the kids. There are so many options for entertainment, restaurants, salons, and cafes. This is the largest mall in Singapore. It has everything that a mall can boast of and you cannot and will not get bored when you are here. The options for entertainment, movie screens, restaurants, cafes, bars are endless. This barrage is a dam built at the confluence of five rivers. You can come here to taken scenic shots of the Gardens by the Bay and the Marina Barrage itself. You can fly kites, play with frisbees and wat the sun go down into the horizon. It is a nice breezy place, so buy some snacks and have a small picnic. 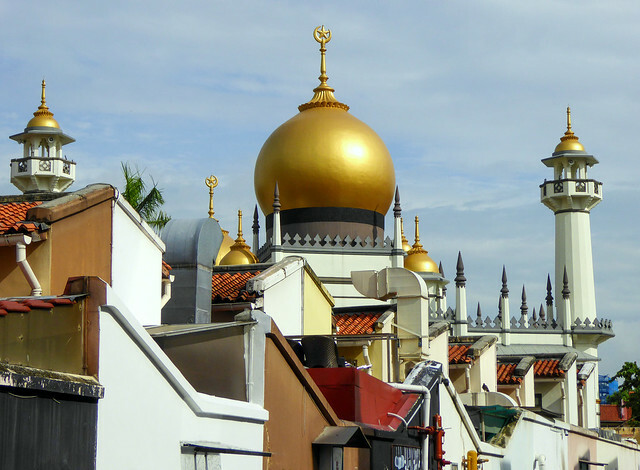 The largest mosque in Singapore, located at North Bridge Road was built by Sultan Hussain Shah of Johore in 1824. It has the typical Islamic architecture with a large golden dome on the top of the building and minarets. Other similar places of worship that you can visit are Abdul Gaffoor Mosque, Al-Abrar Mosque, and Hajjah Fatimah Mosque. This is a grand bright red Buddhist Temple located in Chinatown. The architecture and the interiors are stunning. You will be dazzled by the many thousands of golden Buddha statues that adorn the wall. It is four-storeyed with a hall having a high ceiling. The main attraction inside the temple is the solid stupa measuring 2 meters made of gold on the fourth floor where the sacred relic is kept. There is a vegetarian restaurant in the basement serving free food, a garden on the topmost floor, and the best place to learn about Buddhism. Other Buddhist religious places in Singapore to visit are Temple of 1000 lights Siong Lim Temple, and Leong San See Temple. This is Singapore’s oldest Hindu temple built to honor Goddess Mariamma. Visit this place to observe the temple architecture especially that of the gopuram, which is an elongated pyramidal structure on the top. There are many colorful idols that are placed on the gopuram. 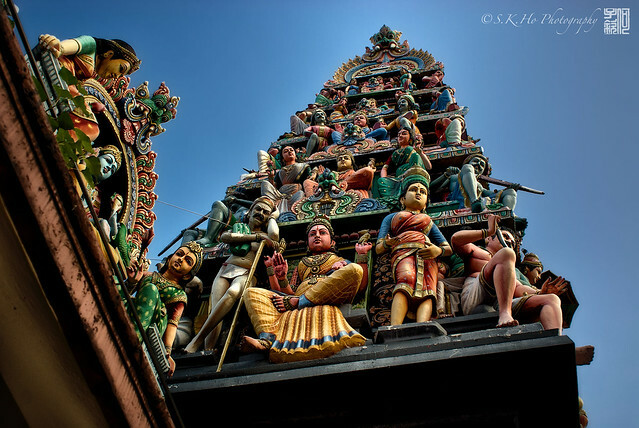 Other Hindu places of worship in Singapore are Sri Krishnan Temple, Sri Srinivasa Perumal Temple, Sri Thandayuthapani Temple, and Sri Veeramakaliamman Temple. 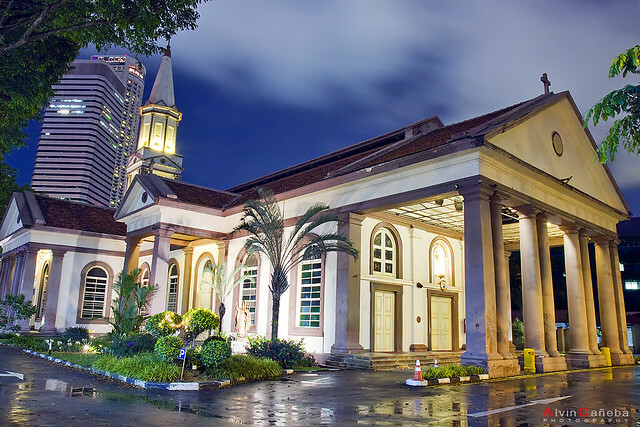 This is the oldest Roman Catholic church in Singapore built between 1844 – 1847. You can visit the church on Sunday’s to see a Sunday Mass. Other places of Christian worship are St Andrew’s Cathedral and Church of St Gregory the Illuminator. Narrow alleyways selling a myriad of things. It is pleasant to take a stroll here and you can see colorful paper lanterns hung on strings all across the street. Great place to shop for souvenirs, enjoy street food, and spend time in the evenings. There are flea markets, bookstores. retail shops, and a handicrafts center. 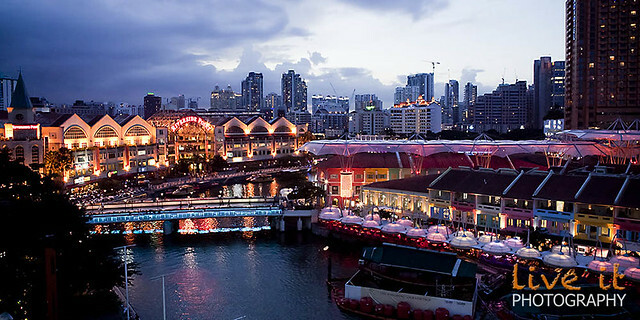 Located upstream from the mouth of the Singapore River and Boat Quay, Clark Quay is a pleasant experience. There are many riverfront restaurants to enjoy fine dining. The bars and restaurants are lively. The best time to visit in the evenings and during the night. Singapore is one of the safest cities on the planet. Law enforcement is strong and literally, nobody even tries to toe the line here as the punishment is harsh. You can easily travel in Singapore without thinking twice as security is assured here. Public transport system function well into the night and you can even walk alone on main streets in the night! Dressing tips: If you are planning to enter the mosque or any of the temples in Singapore, please dress appropriately as these are conservative places. Wearing full-length trousers and a good t-shirt is recommended. When you are out exploring the city, in general, you can wear shorts and spaghetti tops to beat the heat. Most attractions are close to each other, so walking is a great option to travel. Wear comfortable footwear. Also remember that, if you wear sneakers, you will sweat a lot since the climate is humid. Pack well. Singapore is the perfect family holiday destination. Everything in Singapore can be enjoyed by kids minus the nightlife, of course. There are many eating options offering a wide variety of international cuisines to indulge in. Traveling with a family having kids is so much fun in Singapore. This travel tip is for the men. This most probably happens with solo male travelers or a bunch of guys hanging out. A pretty lady will approach you to flirt and tries to cozy up. Since the chances of the tourist being drunk on holiday are quite high, she will accuse the guy/guys of sexual harassment. Two well-built guys who are her accomplices in the crime turn up and ask for hush money. Punishment for crimes in Singapore are so severe, the victim (guy) ends up paying thousands of USD. This can happen in a restaurant. If you give your card for swiping to pay bills, always ensure you got your own card back from the waiter. There have been instances where the waiter swaps the card with an old and fake one. Monks or nuns pleading/asking for money are fakes. Do not entertain them. I hope the Singapore travel guide shared all the relevant information needed for a great holiday experience in this megacity. If we have missed out on anything, please let us know, we would be more than happy to include any tips and suggestions.